Last summer, as part of an ongoing project to find the truth about transfer rates in college basketball, I introduced the term Up-Transferring. It was a way to describe players who upgraded Division I schools, either by transferring from a low-major to a mid-major power (such as Gonzaga), or from a mid-major to a major-conference team, or from a major-conference also-ran to a recent national champ. Up-Transfers represent just a sliver of the overall transfer market, but recently, they've become the most interesting sliver. There were more than 500 transfers last season. That's a large, round number ... that only represents a 1.6 percent increase from 2007-08. The overall transfer market is not markedly different in volume than it was five years ago. Track the Up-Transfer market during the same period, however, and you'll find something on a much different trajectory. Something that might actually called a trend. Up-Transferring was once a barely noticeable activity. 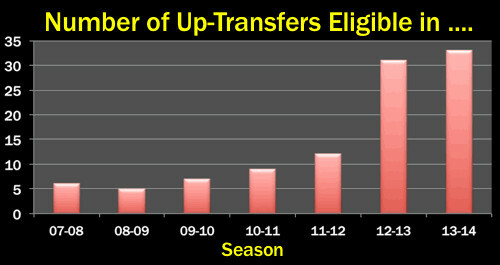 Among transfers who became eligible in 2007-08, 2008-09 and 2009-10, only 5-7 per season could be classified as Up-Transfers. And only one of those players (Bassirou Dieng) used the NCAA's graduate-transfer exception to upgrade schools and be eligible immediately. Here are the full Up-Transfer lists for those seasons, with the most notable cases being Syracuse's Wes Johnson (from Iowa State) and Seton Hall's Herb Pope (from New Mexico State). The first known D-I men's basketball player to use NCAA's grad-transfer exception was Kevin Krueger, who moved from Arizona State to UNLV, the team his father was coaching, in 2006. The exemption allows a player who 1) has earned an undergraduate degree, 2) has eligibility remaining and 3) wants to pursue a graduate program not offered at his current school to transfer to a school that offers his desired grad program and be eligible immediately, rather than sitting out the standard year. Although Krueger's move was a high-profile success -- he was the assist leader on a UNLV team that went to the Sweet 16 -- he did not immediately set off a wave of grad transfers. Great innovations in NCAA loophole-exploitation seem to take a few years to catch on. It became noticeable in 2010-11 and 2011-12, when the rise in Up-Transfers was directly attributable to the grad-transfer boom. There were five graduate Up-Transfers in each of those seasons, including players who had key roles for Michigan State (Brandon Wood) and North Carolina (Justin Knox). Elite teams were using the loophole. And then, in 2012-13, came the boom. The Up-Transfer count jumped from 12 the previous season to 30. Fifteen were regular transfers who sat out a season, four (marked by asterisks) earned undergraduate hardship waivers from the NCAA to play immediately, and the other 11 were graduate transfers. It was not a one-year phenomenon. The same thing happened this season: 30 Up-Transfers are eligible, with three more waiting on waivers. Thirteen are graduate transfers. Oregon could potentially have three Up-Transfers in its rotation in Jason Calliste (formerly of Detroit), Mike Moser (UNLV) and Joseph Young (Houston, with waiver pending). This was the state of affairs from 2009-2011, until the NCAA reinstated the spring period in 2012. Was it a coincidence that the wave of graduate Up-Transfers started in 2010? Or that the 2012-13 list of eligible Up-Transfers exploded, largely with players who left schools in 2011? All we know is that coaching staffs, who were used to spending spring weekends on AAU-tourney bleachers, suddenly had more time on their hands.